So I have a new adventure I have been pursuing. I recently started writing books with my 3 year-old son Griffin. My mother was a school teacher and it was her idea. We usually find a picture, ask Griffin questions about the picture and he fills in the blanks, which make the story. It is very fun and I highly recommend trying it sometime. Me: What is the robots name? Griffin: The robots name is Rent-Bob. Me: What does the robot do? Griffin: He is a fisherman. Me: How does he catch the fish? 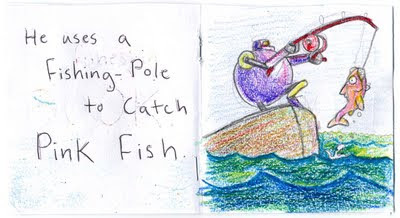 Griffin: He uses a fishing pole. Me: What kind of fish does he catch? Griffin: He catches pink fish. Me: Where does he fish? 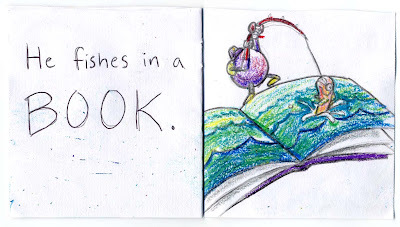 Griffin: He fishes in a book. Here is a picture of the Author to go along with the back cover of the book. To be honest, since I heard about Griffin's diagnoses, I have been less than inspired to draw. Maybe this will be the spark to get me back on the drawing wagon, so to speak. If any of you, out there in the blogging world, would be inspired to illustrate a short Griffin story, let me know and I will send you a story that you can illustrate too. It can be loose, it can be sloppy, and it can be awesome in it's simplicity. I will admit, I have been playing with this character design for a few weeks now. There is a story I have been writing with my sister that will have a robot character in it. This was a good excuse to practice using the robot in scenes and different poses. I used drawing paper, pencil (with no eraser), and crayon. Crayon is an interesting media but can be frustrating when working at a small scale; this book is about 4.5 inches x 4.5 inches. Next time I try my hand using crayons I will do so at a larger scale. 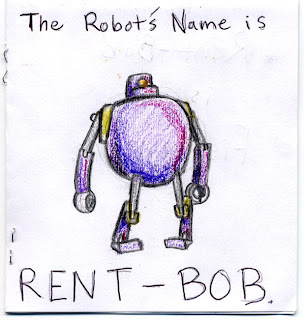 Griffin's imagination is hilarious, Rent-Bob is a fantastic robot name. I've got a few more robots and cheshire cats trickling in, I'll post this along with the rest of em next Friday along with the new challenges. Josh, this is the most amazing, beautiful and inspiring thing I've seen in a long time. I wish your son and your family all the best. I'd be honored and super excited to illustrate one of your son's brilliant stories. I have a 3 year old son myself, and this post has inspired me to try this sort of experiment with him. hey man!! count on me! send a story and i draw. Send u two a big hug from london. That wry expression on his face in that photo is priceless. Hello Josh, I never forget about you Josh, your blog and your son Griffin. There was no response from you, may be you are busy! Griffin is doing a great job so you should keep up drawing. I understand your situation. I am busy visiting my doctor too. And it should be happy and thankful! Good luck on the Griffin book. I am use to crayon. I would love to participate. What an awesome story! Great story and illustration! I'd love to illustrate one of Griffin's stories. Hopefully my drawings are worthy of such wonderful storytelling. All the best, guys! Wow,great story and illustrations... you guys make a great team! Put me down for one of Griffin's stories... monsters, please? Hope you're both doing well. Hi Josh! It's been a while since a came to your blog, and though we had short conversations via-blog, somehow I deeply feel glad to offer my illustration services to your son's Storys hehe, I think it's a great Idea and I'll also be honored if you send me one :D, you and your family have my best thoughs from now on, and cheers from méxico, take care!! Now THAT is fantastic! Great collaboration, really sweet and fun! I like making up stories or comics with my own son, so I know how rewarding it can be! After I got your comment I wanted check out your site. You have some amazing work. 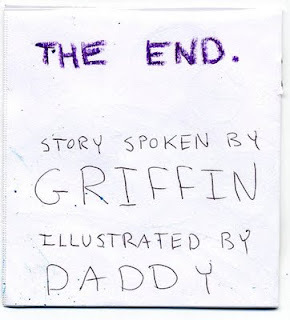 Griffin's story is amazing and I think the idea of creating these books is great. I would love to illustrate one if I could. i am can't draw but i love to see the drawers work, i feel it gets me in a good mood, or even helps me with new ideas for my work, i am photogrpher in the culture section of a newspaper. This story and the reactin of you blogger friends totally melt my heart, and i cant wait to see their interpretation of Griffin's stories. Great idea to connect with inspiration again, and also connect with other artists!!! 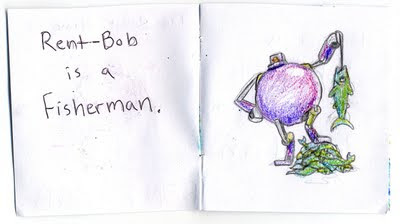 Hi Josh, I'm all for illustrating a story. I heard about your blog from my friends who are all excited to illustrate Griffin's stories :) I would love to do one myself, do let me know if it is possible! What your doing is awesome and I hope your spirits are always high. Lots of love to you and you family. Querina and I dropped the book in the mail on Thursday so hopefully you and Griffin will get it tomorrow! We hope he enjoys reading it as much as we enjoyed putting it together!